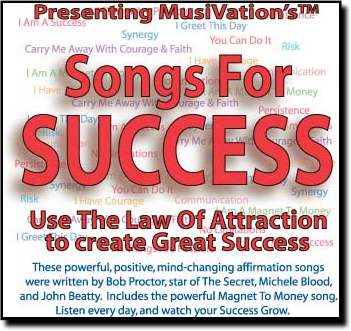 Use The Law Of Attraction with a world's first, 10 magnificent MusiVation™ Success songs written by Star of "The Secret" Bob Proctor, Michele Blood, and J. Beatty with positive messages that will go instantly into your subconscious mind. These Success and money affirmations will go into your subconscious mind 300 times faster than any other method! It comes with a special instructions book and all of the affirmations. List of Songs: Success, Greet This Day, Persistence, Risk, Magnet To Money, Carry Me Away, Communication, Synergy, You Can Do It, No Limitations. Play this over and over and watch you mind return to its pure state of positivity and POWER. YOU will become a MAGNET TO SUCCESS! If you want to buy MP3 version click on "Add To Cart" or if you would like to buy actual CD and have it mailed to you Click Here To Purchase Actual CD.